Glenn Franklin VanBlaricum of Goleta, California, died of pneumonia at Santa Barbara Cottage Hospital on March 13, 2015. He was 94 years old. Glenn was born on May 18, 1920, on a small farm in Decker Township south of Noble, Illinois, to Mary Jane (Mollie) Long VanBlaricum and James VanBlaricum. He was the youngest of their eight children. Glenn graduated from Noble High School on May 25, 1938. In the fall of 1938 he started college at Eastern Illinois State Teachers College (now Eastern Illinois University) in Charleston, IL. He majored in physics with a minor in math and chemistry. However, after the first year he saw that he would not have enough money to finish college, so he borrowed fifty dollars to take teaching classes at Eastern in the summer and passed the Illinois Teachers Credential exam in August, 1939. In the school year 1939-1940, he taught 1st and 2nd grade at Thomas School south of Clay City, IL, and in 1940-1941 he taught grades 1, 3, 5, and 7 at Gray School south of Noble, IL. In July 1941, he volunteered for the U.S. Army Air Corps and trained as a fighter pilot, receiving his wings and commission as a 2nd lieutenant on July 3, 1942. While on leave, on July 16, 1942, he and Mary Ellen Shearer of Olney, IL, eloped to St. Charles, Missouri, where they were married. Lt. VanBlaricum flew a Bell P-39 Airacobra fighter plane in Tunisia during the North African campaign and served as a base operations officer in Florida later in the war. He earned an Air Medal with one Oak Leaf Cluster. He was honorably discharged as a First Lieutenant in 1945 but stayed in the Air Force Reserve until 1956. Glenn taught at Noble Grade School, Noble, IL, from 1945 to 1948 and at Newton Consolidated School, Newton, IL, from 1948 to 1951. He then received a Bachelor of Science in Education from Eastern in May of 1952. He later completed a Master of Science in Education in August of 1955, also from Eastern. He served as principal of elementary schools in Toledo, IL, from 1952 to 1954 and Momence, IL, from 1954 to 1961. In 1961 he and his family moved to Princeton, IL. At that time, he took a hiatus from teaching to work for the textbook publisher D.C. Heath and Company. 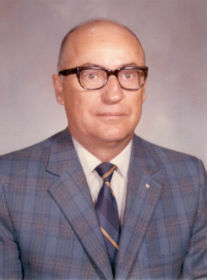 In 1967 he became superintendent and high school principal in Wyanet, IL, retiring in 1972. The longest-lived of his generation of the VanBlaricum family, he was predeceased by his parents; his sisters Effie Mae VanBlaricum Schnell and Wanda Nadine VanBlaricum Patterson; his brothers William, Edgar Lowell, James Otho, Verle Everett, and Elbert Clendus VanBlaricum; and an infant son Thomas Lynn VanBlaricum. Glenn is survived by his wife of 72 years, Mary Ellen (Shearer) VanBlaricum, of Goleta, CA, and his two sons and their families: Glenn F. VanBlaricum Jr. and his wife Claire Bernadette VanBlaricum and Michael L. VanBlaricum and his wife Pamela Calvetti VanBlaricum, all of Santa Barbara, CA. He was the proud grandfather of three grandchildren: James Robert VanBlaricum of Los Angeles, CA; Ann Calvetti VanBlaricum Harrer and her husband Nicholas James Harrer of Pasadena, CA; and Susan Michelle VanBlaricum of Cambridge, MA. His great-grandchildren are Ellen Calvetti Harrer and Calvin Van Harrer of Pasadena. He is also survived by many nieces and nephews. Glenn was a 32nd-degree Mason, a member of the Olney Masonic Lodge No. 140, and a member of the American Legion Post No. 30 of Olney, IL. To share a memory of leave online condolences, please visit www.wrhsb.com. Arrangements by Welch-Ryce-Haider Funeral Chapels.